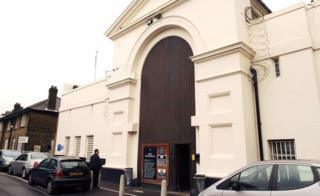 Two prisoners have escaped from HMP Pentonville, the Ministry of Justice (MoJ) has said. The escape was discovered when officers carrying out checks found two pillows made to look like bodies in the prisoners' beds on Monday. It is understood the inmates, aged 28 and 31, used diamond-tipped cutting equipment to break through cell bars before they scaled the perimeter wall. Both were on remand, one for attempted murder and the other for burglary. The men were not required for prison work, which is why they were not reported missing until 12:00 GMT, the BBC's home affairs correspondent Danny Shaw said. He added staff were expected to conduct a visual check on prisoners at about 07:00 GMT. It is understood pillows in their cells were made to look like bodies, but it's not clear if they had other objects or coverings on them. Initial reports suggested mannequins had been left in the beds. A prison spokesperson said: "Public protection is our top priority and we take escapes from custody extremely seriously. The escaped prisoners were on G wing, the same wing where 21-year-old prisoner Jamal Mahmoud was fatally stabbed last month. Basana Kimbembi, 34, has been charged with his murder. Following the attack, about half of the 200 prison officers passed a vote of no confidence in Pentonville governor Kevin Reilly. The officers claim they cannot stop drugs and weapons being thrown over prison walls. Camilla Poulton, chair of the Pentonville Prison Independent Monitoring Board, said: "Clearly this is a regrettable incident. "As we reported in the summer to the Secretary of State for Justice, HMP Pentonville will remain a soft target for contraband and other security breaches as long as its dilapidated windows are in place, notwithstanding the efforts of management and staff." She added a member of the monitoring board was at the prison on Monday and that it would closely follow the prison's response to the escape. The National Chairman of the Prison Officer's Association, Mike Rolfe, said "We've been warning for a long time that there's a severe shortage of staff, staff are under pressure. "Pentonville's one of those jails that's suffered really terribly from staff shortages and, you know, people not wanting to join the job there." The last prisoner to escape from Pentonville was convicted murderer John Massey in 2012. He sneaked onto a roof after a gym session and then climbed the prison's 25ft (8m) outer perimeter wall using a rope made from netting. He was found two days later.